See You At The Pole, a national evangelical student lead prayer event was this morning and it happened at three of the schools here in Ramona. I don't know how it goes in other towns but here in Ramona it's a pretty cool event. 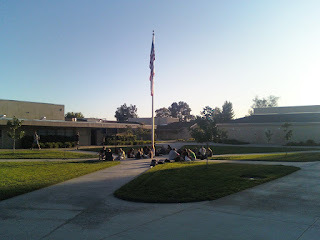 Students from all different churches (unfortunately there could be much more diversity than there is) gather around the flag pole before school and they pray together (simple things like that are usually good). They've been doing it at least since I was in high school so it's been around for at least a few years. The only problem with students gathering together for prayer in a public place for all to see is that if that prayer is not coupled with action, if the students don't take discipleship seriously and if they're not radically loving and compassionate, then their prayer can look like a fraud... or even worse... it could define the church itself as a group of people who pray to God but don't really care about the world. But if students really do pray for the things God prays for (weird thought: does God pray?) and then live to become the answer to those prayers then their public worship can be Eucharistic and holistic--a foretaste of the Kingdom of God. That's my prayer for all the students around the United States who are praying in front of their school this morning; that their prayer would be coupled with action and that it would be a signpost of peace in the midst of chaos and love in the midst of divisiveness and bickering. My prayer is that their prayer would not be source of more bickering and more division (as I know it has great and dark potential to be) but that it would be simple and hopeful and inviting... setting aside differences and focusing on God's hope for the world.